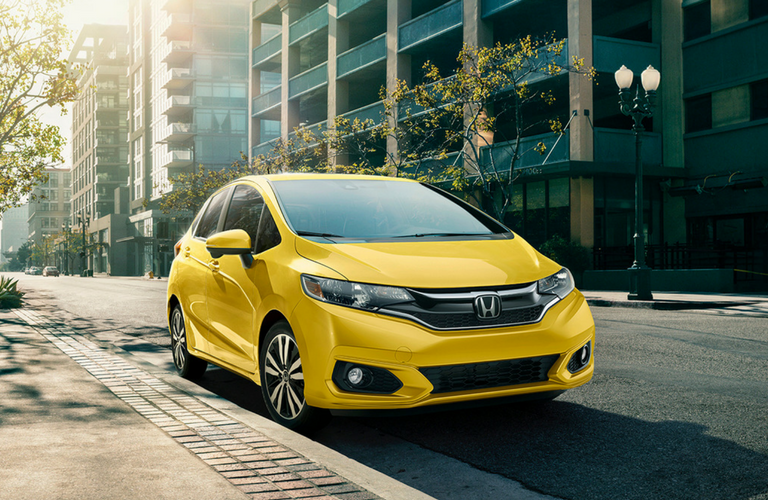 The all-new 2018 Honda Fit came with upgrades and updates in both the interior and exterior designs, and a number of new features designed to make the driving experience an easier and safer one. The new Fit also came with the introduction of a Sport Trim, and a brand new colour added to the list of colours to choose from. If you’re interested in driving a best in class exciting compact hatchback and having an exciting and fun coloured car is important to you – look no further. The 2018 Honda Fit has eight colour options for you to choose from, and trust us, there is a colour for everyone. These colour options are available on all trims of the Fit. Each colour comes with an interior cloth colour of black, and an interior leather colour of black as well. Only the EX-L trim gets leather as an interior standard. If you’d like cloth, but you want something different than the traditional cloth interior, the Sport trim features black cloth with features orange contrast stitching. What’s the difference between paint types? You may be wondering what the difference is between a gloss, pearl, or metallic paint – or why that even matters. The difference is in how the paint is designed, and what is in the paint. When creating paint for cars, manufacturers often mix the paint with flakes of synthetic materials so that the paint captures and reflects light in different ways, making for more interesting effects on the car. Some effects cause the paint to glitter in the sun, while other effects subtly change the colour of the car depending on the angle you look at it, and some effects create a subtle depth to the paint colour, similar to a glowing effect. The most standard paint type is a Gloss paint. Gloss paints usually come as deep reds, bright blues, oranges and golds. For Gloss finishes, it isn’t about what’s in the paint but rather what’s on top of it – a high-gloss clear coat. This high gloss finish gives the paint durability as well as a shiny, glossy finish you’d imagine. Metallic finishes are done by using very small flakes of metal, typically aluminium, to give the paint a more obvious sparkle. The flakes are all the same size and mixed in even parts with the paint itself. This effect gives the car a metallic, glittery shine that does not change the colour of the paint. Pearl finishes are paint mixed with small synthetically produced mica, which has a sheen similar to that of a natural pearl. These give the car a colour that appears to change slightly as you look at it from different perspectives, giving an illusion of shaded or illuminated areas, depending on the lighting. Colour is the one thing that is very personal, which means it’s hard for any salesperson to give you a real recommendation. What our Honda sales team can do is tell you pricing options, as different colours and finishes have different prices, and let you know what options are available to you. Visit Henley Honda and see our team for more information!